So much did she enjoy making our homemade magazine wreath last year, that one of the first Christmas activities Immy requested this year was to make a new wreath to hang on our front door. 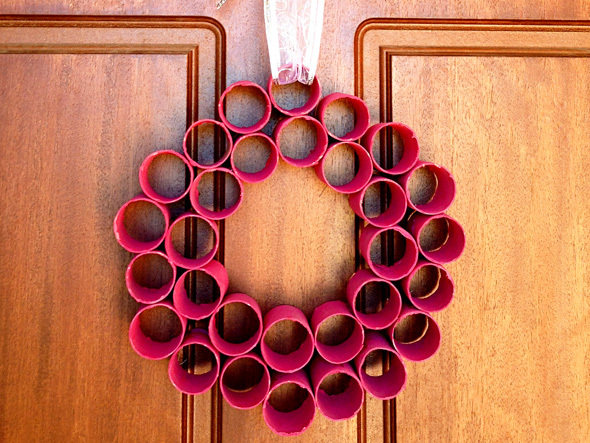 Wanting to do something a little different, I wondered how the lovely circular shape of paper rolls would translate into a wreath shape. Our rolls were collected through the year from birthday wrapping paper but you could just as easily use those from food wrap, paper towel or toilet paper. I cut ours to a size of about 5cm tall. We used 30 in total. Immy and I had fun painting them inside and out. 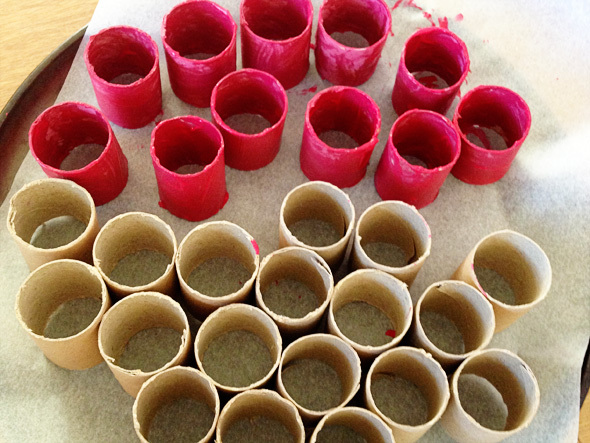 We mixed up a pinky-red, child friendly acrylic paint but I think these would also look fabulous painted with a metallic paint or (if involving older children) with a two tone effect – one colour for inside the tubes and one for outside. Once the paint was dry, I stuck the rolls together using the hot glue gun and added a silver ribbon for hanging. 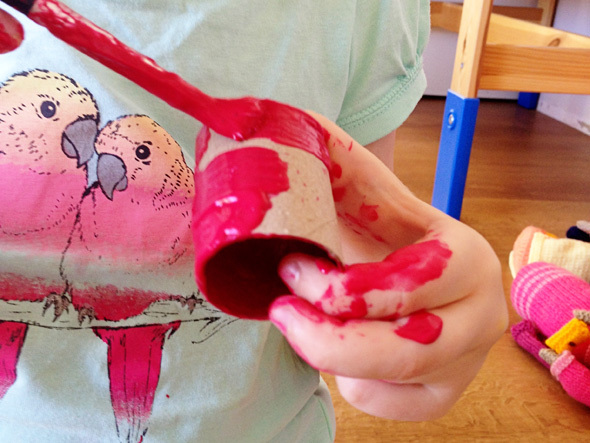 What have you been making with the children in the lead up to Christmas? Thanks for stopping by and saying so, Becky :) Merry Christmas. What a fantastic idea! I think we need to invest in a hot glue gun.. Each year we've made a present for the aunts uncles and grandparents. This year we've been making decorations by shaping pipe cleaners then threading pony beads on them. Simple, cute and great for hand eye coordination. The other advantage for my nearly four year old is that each decoration only takes about 10 minutes so if she's having a low concentration day we just make one, but when she's in the groove we make 5! Love your handmade gift idea, Kirsty, sounds perfect for involving a four year old :) I LOVE our hot glue gun, it is just so quick and handy for so many projects! This is so clever and looks great. A lovely idea! We went a step further and filled the tube holes with old ping pong balls that we had painted and covered in streaks of glitter glue. It looks like a wreath made of Christmas baubles!